At every level in education, a major topic of the day is the need to expand STEM Education (Science, Technology, Engineering and Math). This is true at all levels, and there is also great interest in exposing females to these career fields. This reminds me of my children’s maternal great-grandmother, whom I knew. Her name was Della Permethia Henderson McDowell, as befits her generation at the time of her birth. She grew up in Paris, Texas and married young. Her husband owned a lumberyard and died young, leaving her to run the business and raise two small boys. She did both well and was able to send her sons to college during the Great Depression. One was an All American baseball player who played professional baseball and became a university coach. The other became a university president. Della loved math, and practiced algebra well into her nineties. Her son would buy her the latest algebra text from the university book store and she spent hours “doing algebra” on legal-size yellow tablets, writing with a large black felt tip pen. In her bedroom was a wall hanging she had embroidered with a picture of a young girl standing on a box at the kitchen window washing dishes, watching two boys walk down the road with fishing poles on their shoulders. The caption read, “I wish I were a boy.” My message to girls as I talk to them about college and careers is the good news today is they don’t have to wish they were anything but who they are. If motivated, all options are available to them. A Stakeholders Summit was held on October 12 to discuss the National Crisis in K-16 STEM education, funded by a National Science Foundation (NSF) grant received by RCC, thanks to Dr. Laurie Miller McNeill, Director of Grants Development. Presenters and attendees included representatives from MIT, Columbia, six Rockland County School districts, and business partners from IBM and Regeneron. Dr. Jim Gates from the President's Educational Taskforce on Science and Technology in Washington also participated in the activities. Working groups are being created to design and recommend regional outcomes to the NSF. On October 13, RCC co-hosted the 6th Annual Education Summit with a consortium of educational partners from Rockland County. The agenda this year included financial aid, cyber-bullying, yoga, and a STEM activity presented by Professor Peter Arvanites. Dr. Pedro Noguera, Executive Director, Metropolitan Center for Urban Education, New York University served as the keynote speaker. RCC co-sponsored an event with the American Association of University Women (AAUW) on October 20 for 7th and 8th grade girls to give them a practical understanding of STEM careers through hands-on workshops. Faculty members Dr. Nan Salama, Dr. Susan Golz, Lisa Schachter, Rixi Thomas, Peter Arvanites, Lynn Aaron, Doria Hillsman, and Xin Ye, and Events Coordinator, Doreen Zarcone participated in the program. 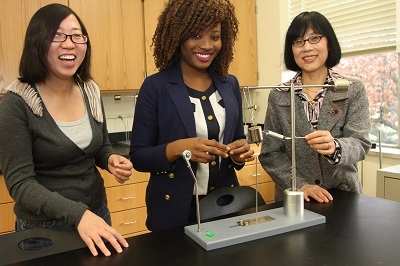 Each of the three women pictured has experience and an interest in electrical engineering. In the middle is Nina-Richie Nwosu, a student who came to RCC in January 2012. She is now the student member of the College’s Board of Trustees. Her major is Math/Science, and she plans to study electrical engineering when she transfers from RCC. On the left is Xin Ye, Instructor of Electric and Computer Technology. Her undergraduate degree is from Hefei University of Technology, and her Masters is in Electrical Engineering, and she currently advises our popular Robotics Club. On the right is Liya Li, PhD, Professor of English. As a student in China, Dr. Li was assigned to study Electrical Engineering because of her aptitude and abilities. When she came to America, she discovered her passion for English and literature. Dr. Li also has the soul and pen of a poet. The important thing about this picture is that in America we need to be certain that all options are open to women and that they have the right to make choices about their lives and careers. Featured here is the Tasty Topics Working Lunch which was part of RCC’s Stakeholders Summit, Regional Solutions to the National Crisis in K-16 STEM Education Conference held on Friday, October 12. 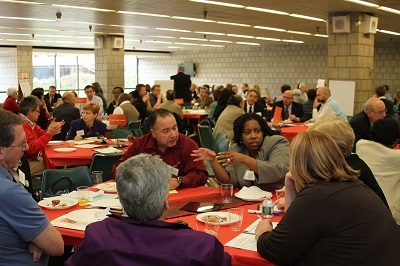 Scientists, educators and business leaders gathered to share ideas and forge alliances with colleagues from other institutions to identify “needs, gaps and opportunities” around key themes in STEM Education.